Recently there has been quite a lot of talk around toxic chemical sunscreen and the active ingredients used in many of today’s sun cream products. Annoyingly there are many active chemicals in sunscreen, how do we know which ones to avoid? 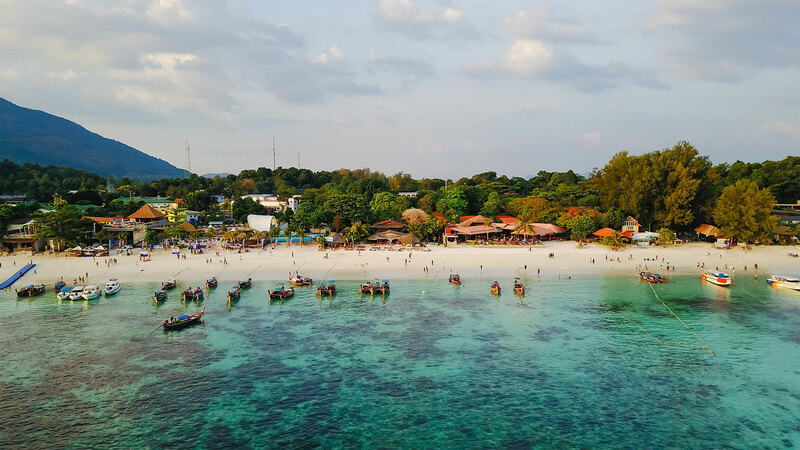 The 2 most toxic chemicals found in many of today’s sun creams are Oxybenzone and Octinoxate, they are found in over 75% of all chemical based sun creams. These chemicals not only have a huge impact on coral reefs, they also have a huge impact on your skin. 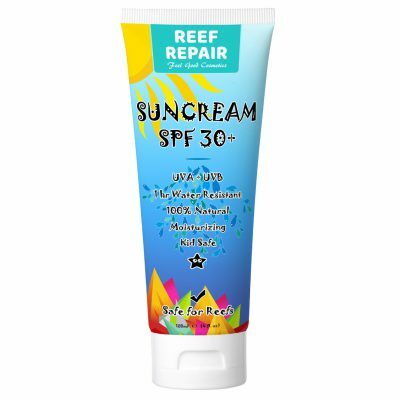 You might even have read that, Hawaii has banned the use of sun creams containing 2 toxic chemicals, Oxybenozone and Octinoxate, that is good for reefs and you in general. Many people are joining the sun care revolution and making the swap to mineral based natural sun care products. But just how bad are these chemicals? These two chemicals alter your hormone balance; this can be particularly dangerous in young children and children at puberty age. In fact, humans use an average of 12 cosmetic and skin based products every day, each containing on average, 8 chemicals, that is an average of 96 chemicals every day we are putting on or into our body. As more chemical based products come onto the market the amount of people with skin allergies has actually increased. finding their way into the food chain and killing off coral nutrients which in turn cause them to bleach and then die. The chemicals in question also stop the corals from growing and reproducing correctly, so no new corals are made and to add insult to injury, those chemicals we mentioned also cause a high mortality rate in young corals, so even if the reefs do reproduce they are likely to die if exposed to these chemicals. 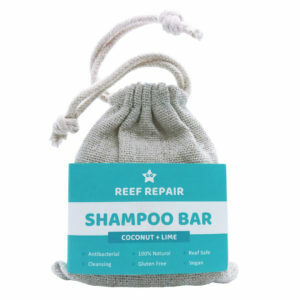 It is estimated that 14,000 tons of toxic chemical sunscreen gets washed into the Ocean annually, meaning the majority of coral reefs around the globe are exposed to Oxybenzone and Octinoxate. 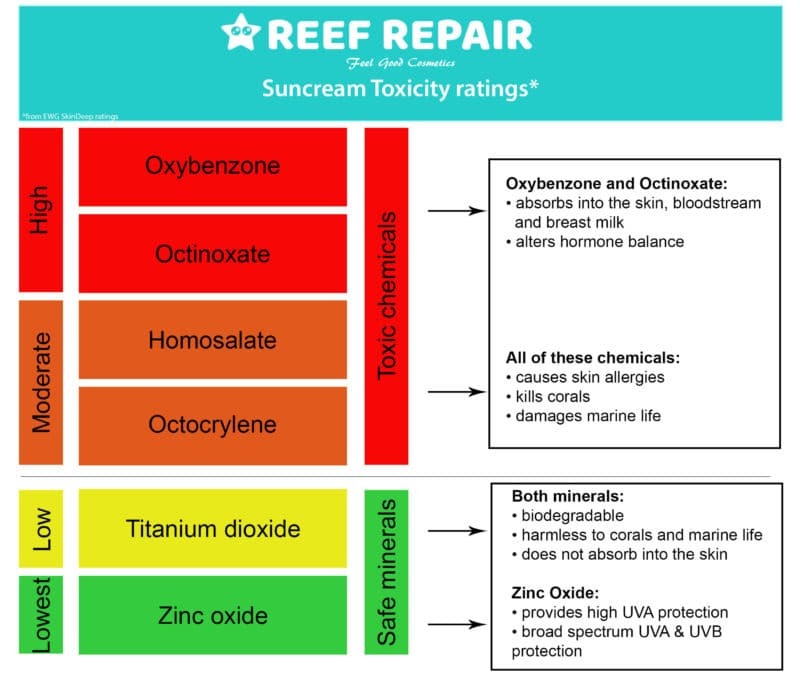 Full disclosure, not all damage to the Coral Reefs is done by toxic chemical sun cream, but chemicals in sunscreens are adding to their destruction and have a proven effect of preventing already stressed and damaged reefs from coming back. 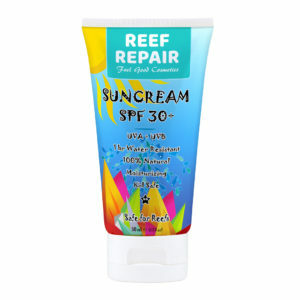 Reef Repair sun creams and sunscreen do not contain chemicals, have no Parabens, Formaldehyde or Titanium Dioxide, it is 100% chemical free sun cream, it is simply an all natural product with the highest quality ingredients to protect and nourish your skin. 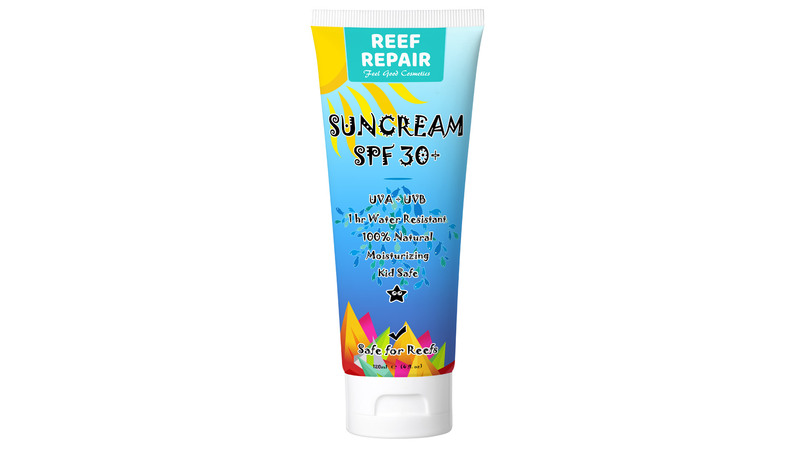 The active ingredient in all Reef Repair products is Zinc Oxide, a natural mineral with amazing broad spectrum protection from the sun. It is a fantastic ingredient for skin and is safe to use on children 6 months and up. Zinc oxide is the main ingredient in nappy rash cream so it is totally safe for babies, although we do recommend consulting a doctor for use on children below 6 months of age. 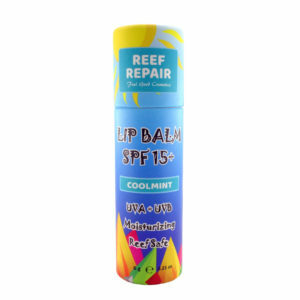 Help protect Coral Reefs, ensure they survive so your children and the rest of us have a future on planet Earth, do something now that matters, swap to a natural, mineral based sun cream, it is the first and potentially most rewarding step in helping save our Coral Reefs.